Research has shown that pets provide owners with psychological and physiological benefits. Pet dogs help people maintain an active routine. Pet owners are less likely to report feeling lonely. Therapy dogs lift mood and often provoke laughter. According to Brian Hare, director of Duke University’s Canine Cognition Centre, simply petting a dog can decrease levels of stress hormones, regulate breathing, and lower blood pressure. Research has shown that petting a dog leads to the release of oxytocin, a hormone associated with bonding and affection, in both the dog and the human. Our beautiful, gentle golden retriever (seen with me in the photograph) is a wonderful companion. He likes a lot of affection and he receives it! We never come home to an empty house…no, we always come home to a house full of dog! He dances and runs with his tail up and wagging furiously then brings us a toy, begging us to play a game. We talk to him, pat him, play with him, love him. He makes us laugh every day. We call him our “chum dog”. Our golden retriever was trained as a pets-as-therapy dog. I took him to interact with mentally ill people and also visited nursing homes where frail elderly people enjoyed patting him and reminiscing about the dogs they used to own. As a therapy dog our retriever brought smiles to the faces of so many emotionally and physically fragile people and he enjoyed their attention. The “Sandy Hook Elementary School shooting” occurred on December 14, 2012, in Newtown, Connecticut, USA, when a gunman fatally shot 20 children and 6 adult staff members. A team of nine specially trained golden retrievers were taken to act as therapy dogs: “K9 Comfort Dogs”. The K9 teams visited schools, churches, activity centres and private homes in the community. Ref. 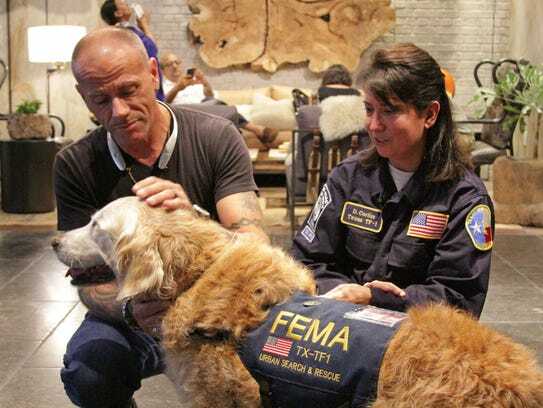 “The Healing Power of Dogs” Canines bring comfort to Newtown survivors and others in crisis. The team of golden retriever therapy dogs was used during grief counselling sessions and to ease the tension and anxiety.